Everyone recognizes the beard—it’s in the Quaker manner, framing the familiar face with its deep-set eyes and sunken cheeks. Yet when Abraham Lincoln was elected president in 1860, he was clean-shaven, meaning a life mask of him created around that time is perhaps the most accurate rendering of the president’s face. A copy of that mask is one of a surprising number of Lincoln artifacts tucked away in the Williams College collections. Some four dozen of these objects were the basis of last spring’s exhibition “Lincoln to the Nth Degree: The Dissemination of Abraham Lincoln’s Image and Ideas in Popular and Fine Art,” organized in honor of the bicentennial of his birth. 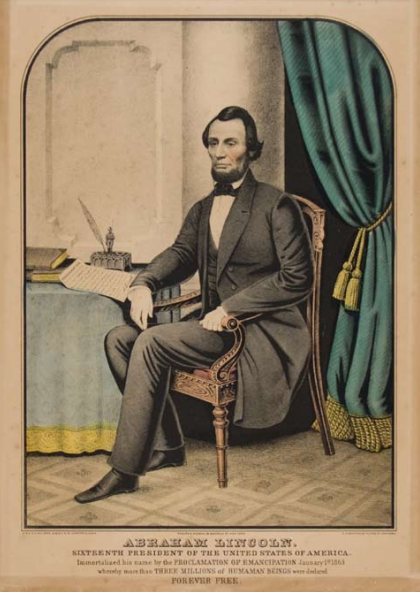 It was a case of the College as curio cabinet, with lithographs, stereographs, copies of the president’s signature, poetry and even a decorative presentation of the Gettysburg Address highlighting how “Lincoln’s fame was constructed in an age that redefined ‘originality’ and ‘reproduction,’” according to organizers Nancy Mowll Mathews, Eugénie Prendergast Senior Curator of Nineteenth and Twentieth Century Art, and Robert Volz, custodian of the Chapin Library. 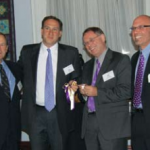 Most of the objects were gifts from alumni—many from Sidney Newborg, Class of 1904, of whom little is known. For a century, Americans have been reminded by the pennies in their pockets of Lincoln’s profile. The following pages offer a fresh glimpse of America’s 16th president in his own time. In the spring of 1860, candidate Lincoln was approached by sculptor Leonard Wells Volk. The son of a Pittsfield, Mass., marble cutter, the artist had trained in Rome and wished to sculpt a likeness of Lincoln. To simplify the sittings, he asked to make a life mask. 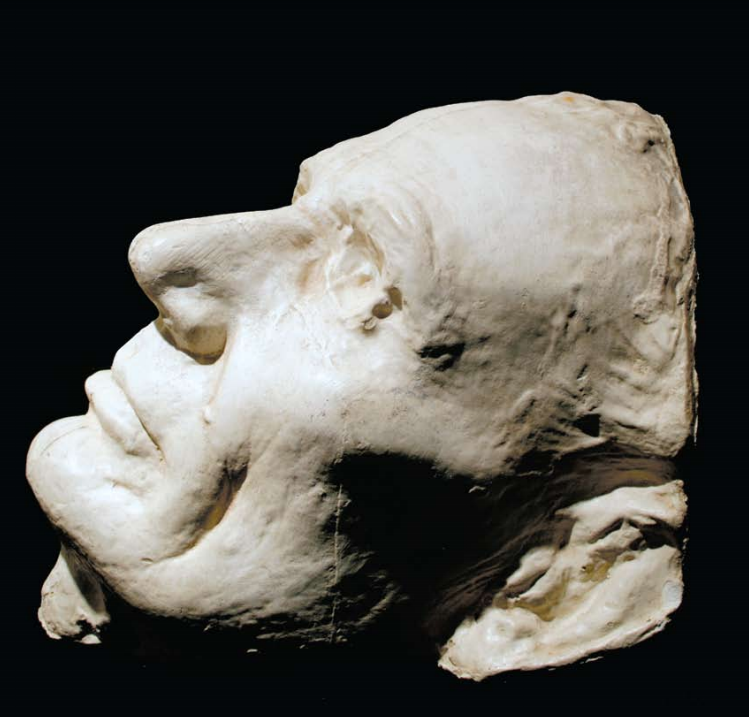 Lincoln agreed but found the process of being encased in wet plaster, with straw emerging from his nostrils, “anything but agreeable.” Still, the subject observed on seeing Volk’s finished bust that the artist had captured “the animal himself.” Many copies were made of Volk’s life mask, including a set of 33 in 1888, when the original was donated to the Smithsonian. While the date, maker and provenance of the above copy is unknown, the life mask is surely a more exacting record of Lincoln’s physiognomy than many more popularized likenesses made by engravers, painters and lithographers. Lincoln gently rejected the proposal in his response to Grace but, after the election, grew a full beard that left image-makers scrambling. Though they had not yet seen the new facial hair, the Kellogg brothers, proprietors of a highly successful printmaking firm in Hartford, Conn., cobbled together a new Lincoln. The imagined beard they added to a drawing based on an existing Mathew Brady photograph resulted in this rather odd likeness. To museum-goers, Winslow Homer is perhaps best known for his seascapes in watercolors and oils, but for almost 20 years the young Homer was a workaday illustrator contributing to newspapers and magazines. The technology to reproduce photographs in printed form had yet to be developed, so Homer and others were hired to sketch scenes that were then rendered as woodcuts for reproduction in printed form. 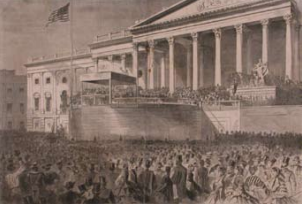 This image of Lincoln’s inauguration ran as a double-page centerfold in the widely popular Harper’s Weekly on March 16, 1861. The image is dominated by a detailed perspective drawing of the Capitol, possibly drawn by another and engraved before the event. But the sketch also portrays Lincoln declaiming from the portico and, on both sides of the foreground, African-American figures hint at the tensions surrounding the election. Barely a month after the publication of Homer’s Inauguration, the first shots of the Civil War were fired in the harbor at Charleston, S.C.
E.G. Renesch produced numerous patriotic posters in the World War I era, including at least three that featured African Americans. 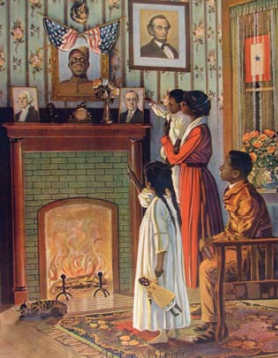 While the principal subject of this image is an absent family member, the picture of the uniformed husband and father is no larger than that of Lincoln hanging nearby. By the early 20th century, Lincoln, the “Great Emancipator,” had become one of an array of symbols the artist employed. 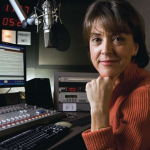 Among the others are the warm and welcoming fire on the hearth, an overall sense of domestic comfort and even social status, Founding Father General Washington and then-President Woodrow Wilson. The in-service flag in the window announces to the neighbors that this family has done its part for the war effort. True Blue came much later than the other images reproduced here—it was published in April 1919—but it suggests how Lincoln in the decades after his death entered American iconography. 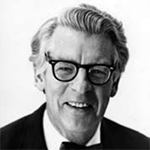 Many Americans learned of current events from lithographers Nathaniel T. Currier & James Merritt Ives, who characterized themselves as “the best, cheapest and most popular [printmakers] in a democratic country.” Their versions of contemporary happenings, however, sometimes played fast and loose with the facts. 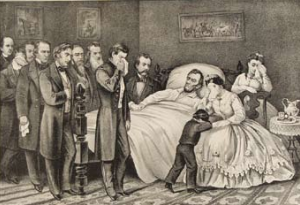 In this case, the victim’s gunshot wound to the head is nowhere in evidence; the room where Lincoln died would have been too small for the crowd pictured; and son Tad, seen here sobbing on his mother’s lap, hadn’t been allowed to visit the dying president. But Currier & Ives had long recognized the public’s desire for sentimental scenes, and this dramatization served that appetite. When seen through a viewer called a stereoscope, images like these give the illusion of three dimensions (the eye is fooled by the use of paired images that differ slightly in perspective). 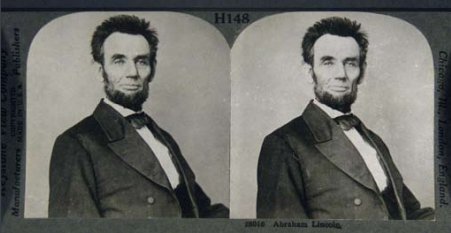 First developed in 1840, stereographs were widely popular by the Civil War era. 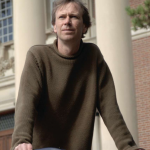 Hugh Howard is the author of The Painter’s Chair. Research assistance for “Lincoln to the Nth Degree” was provided by Williams College graduate students in the history of art George Philip LeBourdais ’08, Layla Bermeo ’09, Jamie Sanecki ’09, Rebecca Shaykin ’09 and Bree Lehman ’10 as well as undergraduate Ruth Ezra ’10.